As the baseball season winds down, there is one more chance to win incredible tickets and contribute to the Paul Booth Legacy fund! Whether you are in DC, want to gift the tickets to a friend, or just want to contribute to the legacy of one of our country's greatest organizers, make a contribution to the baseball raffle below for tickets this Thursday, September 20th, to the Nationals vs. Mets game! 3. A missionary for a movement, a living adjective in motion. Just click on the game to contribute and enter for a chance to win four incredible seats to one of the last games of the season (a $320 value)! $50 per chance (unlimited entries!). 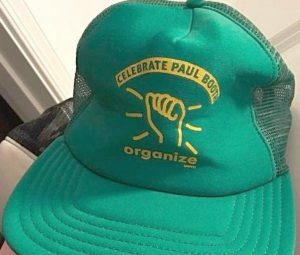 Contributions to the Paul Booth Legacy Trust account will help support a joint mentorship and internship program created in Paul's name for the next generation of organizers. Not tax deductible. DemList is a daily political column dedicated to informing and connecting you on the issues, politics and the players.